Remove light swirls and restore your vehicle's shine with the Porter Cable 7424XP Polisher Combo! The user-friendly Porter Cable 7424XP offers swirl-free polishing action. 5.5 inch Lake Country CCS foam pads eliminate paint imperfections. This exclusive Porter Cable 7424XP Special is the best value on the 7424XP polisher, three premium Lake Country foam pads, and two essential McKee's 37 products. Start smoothing and polishing your vehicle the right way with Porter Cables legendary orbital polisher with three 5.5 inch foam pads. The Porter Cable 7424XP dual action orbital polisher is a favorite among detailers and hobbyists for its easy operation and consistent results. The machines dual motion safely blends away swirls and scratches until the entire paint finish is as smooth and shiny as the day you drove the vehicle off the car lot.�It doesnt take years of experience or special training to get fantastic results every time with the Porter Cable 7424XP polisher. With hook facing, this plate allows you to switch pads quickly and continue polishing. A recessed edge and flexible urethane construction gives your paint extra protection from run-ins with the backing plate. Strict tolerances on weight, balance, roundness, and flatness ensure consistent performance time and time again. This light cutting pad is designed for the removal of mild to moderate swirls and scratches and light oxidation. This is a�dense, closed cell foam�that effectively levels the edges of scratches until they become flush with the surrounding paint. The orange light cutting foam pad is the most popular pads for the Porter Cable 7424XP and it works on the most common paint imperfections. Try McKee's 37 Jeweling Wax as the finale of your compounding process or, if your paint is already in great shape, use it after washing. Applied with your dual action or rotary polisher, the gentle cleaners blend away minor flaws - like spider webbing, haziness, and overall dullness  to increase depth and clarity. At the same time, a layer of carnauba bonds to the paint surface to further enhance the dynamic shine created by the polish. What cant be removed with the cleaners and micro abrasives is filled in with carnauba to create a smooth, flawless finish. Its perfection and protection in one! The Porter Cable 7424XP Special makes a perfect gift for anyone that wants to start detailing by machine. The 7424s dual jiggling motion makes it virtually as safe for your vehicle as detailing by hand, but much faster and more effective.�Bring out the best possible finish on your vehicle�with confidence�with the Porter Cable 7424XP Special. Da Polisher excellent! McKee 37 Fast polish fine cut w/ orange light cutting 5.5 pad- is excellent for very fine imperfections. Also, can be used often with white polishing pad. Jeweling wax with the gray finishing pad works well. After some research I bought this item. Works great, no problems or worries about using this on my cars. This is my first time using this equipment and it was real easy and there are a lot of great "how to" videos on Youtube that can get you ready to use the PC. If you have more than one car invest in some more pads. I bought this DA about a year ago for personal use. First one Ive used on my cars. The how to video that came with is was very educational as it shows you exactly what to do and at what speeds. It is very easy to use and the variable speeds are great. I have used it on my cars as well as some friends cars. Can't complain. Great polisher! ProsEase of use. Great combo pack! I received this a couple weeks ago because my son wanted to detail the outside of his car. We went to town with this polisher and I(an automotive professional for 35 years) was truly impressed with the results! ProsNice size, plenty of power the dual action is great and this unit seems to be very durable. Porter Cable has a great reputation and I'm sure this polisher will last many years. Very well made. Did the job of detailing 3 cars. ProsQuality and ease of use. Combo pk very practical and cost efficient. Awesome polisher for a beginner. This polisher taught me how to detail! It would be 5 stars if it was a little more powerful. I am changing it to a 3" backing plate, and that should fix that problem! Awesome machine, and very versatile. Fantastic polisher. I was even impressed with the free products. First time using this and it worked great. Very nice job no swirl marks and made the paint look great. Vrry nice to handle as it was light and easy to control. ProsNo cons that I can see yet. 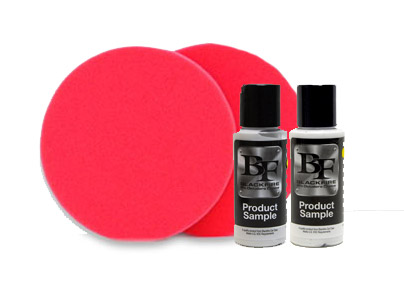 This kit has the popular Porter Cable 7424 dual action polisher and all the pads and plates needed for a professional auto finish. It also came with a GREAT "how to"video, bottle of polish, and a bottle of glaze. I thought the supplied polish dried a bit too fast but that could be personal preference. The product arrived on time, in good condition, and performed as advertised. My Mustang now has some serious shine. I would definitely recommend this for the "do-it-yourself" detailers out there. ProsGreat performance. Good combination of accessories in the kit. ConsThe liquid polish that came in the kit wasn't the best I've used. Took only 3 days to ship from autopilot in Florida to Pittsburgh With FedEx ground. Item was well packaged.